MARGIN STUCCO TROWELS. WITH WOODEN HANDLE. SET of 6 pcs STAINLESS STEEL. Full set, like pictured. 60mm (2.36"). 50mm (1.97"). STAINLESS STEEL MARGIN STUCCO TROWELS. WITH RUBBER HANDLE. SET of 6 pcs. 30mm (1.18"),50mm (1.97"). Silverline 3pc Soft-Grip Margin Trowel Set Hardened & tempered carbon steel blades. Comfortable, soft-grip handles for prolonged use. Finger guard, thumb support & high lift for good knuckle clearance. For finishing edges & working behind pipes or other restricted spaces. 1 x Soft-Grip Margin Trowel 150 x 13mm. Small Stainless Steel Margin Trowel. Size (Width): 50mm. Small Margin Stucco Trowel 30mm (1.2"). Stainless Steelwith Rubber Handle. 3 Piece Margin Trowel Set Kit 13-51mm Hardened & Tempered Steel Blades DIY New. Includes the three most popular sizes: 13, 38 and 51mm. Suitable for edging of textured coatings and plaster ceilings. Hardened tempered steel blades. 3PC MARGIN TROWEL SET. • HARDENED & TEMPERED STEEL BLADES. • SOFT GRIP HANDLE. Grab A Bargain! The Republic of Ireland & The Channel Islands. Northern Ireland, Isle of Man, TR21-25, BT, IM, TR21-25. 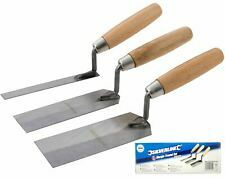 3 Piece Margin Trowel Set: 13mm, 38mm 51mm. 3pc Margin Trowel Set. 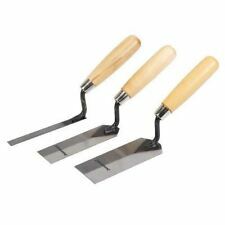 Trowel Set – 3 piece set. Used for Edging Textured Coating and Plaster Ceilings. Hardened and Tempered Steel Blades. Masonry Margin Trowel - 5" X 2" CARBON STEEL BLADE Stock Code: XXX334774 Hardened and tempered carbon steel blade. Durable polypropylene handle. Handy tool for patching and small jobs. Can be used to clean other tools. Forged from a single piece of high grade tool steel. Made in the U.S.A.
MARSHALLTOWN M52D 5" X 2" MARGIN TROWEL. SOLID FORGED HIGH QUALITY CARBON STEEL BLADE WITH DURASOFT COMFORT GRIP. Marshalltown M46116D Pointing Trowel 6" & M52D Margin Trowel 5" x 1.5" with durasoft handles. Ragni R61452S 5" X 2" Stainless Steel Margin Trowel. The Ragni R61452S 5" X 2" Stainless Steel Margin Trowel is manufactured from Japanese stainless steel which provides a strong and rugged blade. Fitted with a robust handle grip with a non-slip finger guard to reduce the risk of fatigue. 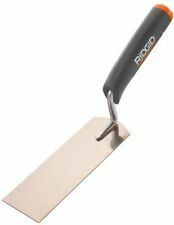 Ragni R6140S 40 X 100mm Rounded Margin Trowel. The Ragni R6140S 40 X 100mm rounded margin trowel is manufactured from Japanese Stainless Steel to provide a strong and durable blade. Fitted with a non-slip grip with a finger guard for protection that is fitted to a solid 8mm stem that is then electro-welded to the blade. Ragni R6180S 80 X 110mm Rounded Margin Trowel. The Ragni R6180S 80 X 110mm rounded margin trowel is manufactured from Japanese Stainless Steel to provide a strong and durable blade. Fitted with a non-slip grip with a finger guard for protection that is fitted to a solid 8mm stem that is then electro-welded to the blade. Ragni R6160S 60 X 110mm Rounded Margin Trowel. The Ragni R6160S 60 X 110mm rounded margin trowel is manufactured from Japanese Stainless Steel to provide a strong and durable blade. Fitted with a non-slip grip with a finger guard for protection that is fitted to a solid 8mm stem that is then electro-welded to the blade. MARSHALLTOWN M54 5" X 1.5" MARGIN TROWEL WITH SOLID WOODEN HANDLE. ANOTHER GREAT DEAL FROM ABBEY HARDWARE. 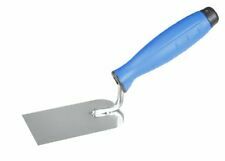 Ragni R61100S 100 X 110mm Rounded Margin Trowel. The Ragni R61100S 100 X 110mm rounded margin trowel is manufactured from Japanese Stainless Steel to provide a strong and durable blade. Fitted with a non-slip grip with a finger guard for protection that is fitted to a solid 8mm stem that is then electro-welded to the blade. Small Stainless Steel Margin Trowel. Size (Width): 60mm. with Rubber Handle. Durasoft handle provides a soft feel. 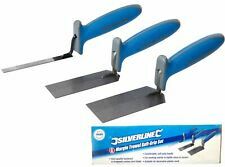 3 Piece Silverline Soft Grip Margin Trowel Set. 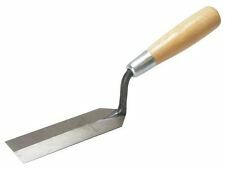 1 x Soft-Grip Margin Trowel 150mm x 51mm. 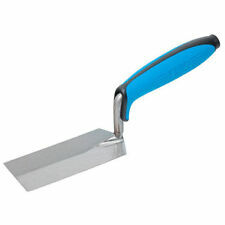 1 x Soft-Grip Margin Trowel 150mm x 38mm. 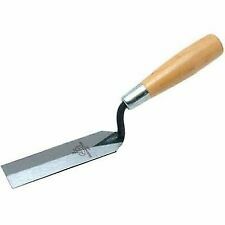 1 x Soft-Grip Margin Trowel 150mm x 13mm. Stainless Steel Margin Trowel. with Rubber Handle. Blade Size (Width x length): 30 x 160mm. DuraSoft handle. 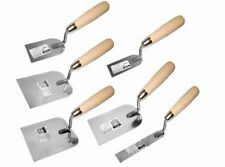 Marshalltown M argin Trowel 5x2". Square ended solid forged blade. Small Stainless Steel Margin Trowel. Size (Width): 50mm. with Wooden Handle. Ragni R61451S Stainless Steel 1-1/2" X 5" Margin Trowel. The Ragni R61451S Stainless Steel 1-1/2" X 5" Margin Trowel is manufactured with Japanese stainless steel to provide a solid robust finish, this is combined with a non-slip ergonomic grip that provides a comfortable hold and the finger guard provides protection. 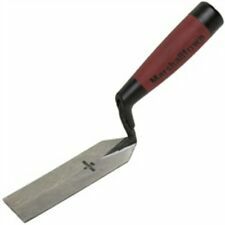 MARSHALLTOWN M52 5" X 2" MARGIN TROWEL WITH SOLID WOODEN HANDLE. ANOTHER GREAT DEAL FROM ABBEY POWER. OX PRO MARGIN TROWEL 125 X 50MM OX-P013405 DURAGRIP HANDLE. Wide Stainless Steel Margin Trowel. Size (Width): 120mm (4.7"). with Rubber Handle. Stainless Steel Margin Trowel. Size (Width): 100mm (4"). Small Margin Stucco Trowel 30mm (1.2"). Blade Size: (Width x Length): 30 x 80mm. STAINLESS STEEL MARGIN STUCCO TROWELS. WITH RUBBER HANDLE. SET of 3 pcs. 120mm (4.72"). The Faithfull Prestige Margin Trowel has been designed for tight spots, detail and cornice work. The ergonomic soft grip handle provides a superior grip and the high lift design allows sufficient knuckle clearance. Often used by plasterers when unable to use a larger trowel, these trowels are also known as a window trowels. The trowel has a high quality steel blade and soft-grip handle, providing greater comfort. Flexible Stainless Steel Margin Trowel. with Wooden Handle. Handyman or D.I.Y. Margin Trowel. Also known as window trowel. Blade 5in x 2in. Goods under £150 - £36.95 Goods over £150 - £44.95. Zone 4 - Bulgaria, Estonia, Italian Islands, Latvia, Lichenstein, Macedonia, Serbia. Stainless Steel Margin Trowel. Size (Width): 80mm (3"). Soft Grip handle for extra comfort. Goods under £150 - £61.95 Goods over £150 - £69.95. Zone 5 - Gibraltar, Iceland, Romania, Turkey, Lithuania. Goods under £150 - £36.95 Goods over £150 - £44.95. Zone 4 - Bulgaria, Estonia, Italian Islands, Latvia, Lichenstein, Macedonia, Serbia. Item #: 246314, Model #: 49190. Kobalt Notched Margin Trowel. Ceramic Floor Ground Steel Square / Rubber Non-Slip Grip Handle. We will work with you. You deserve to be treated with 5-Star Service! Allow us the opportunity to correct any mistakes that may have occurred. Stainless Steel Margin Trowel. Size (Width): 80mm ( 3.15 "). with Wooden Handle. Marshalltown 11198 5 X 2 Margin Trowel – OLD STOCK - MADE IN USA! !